A theodolite is basically a telescope with both a vertical and horizontal axis. The angle of each axis can be measured with fairly accurate precision as long as the operator knows how to use the theodolite and knows basic trigonometry. A theodolite needs two people to measure and align the angles. 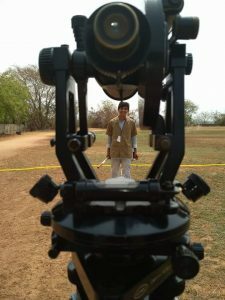 A Theodolite specialises in angle measurements ( horizontal and vertical ) to the precision of degree ( new ones can precisely measure angles in seconds, 1/3600th of a degree ). Usually, it consists of a telescope mounted on two rotating disks or dials ( marked with degrees from 0 to 360 ). The telescope can be rotated horizontally as well as vertically for angle measurements. Total station on the other hand, is a multipurpose surveying instrument based on electronic distance measurement (EDM). They can measure distance, angles, elevations with a high level of precision. The data collected by a total station can be transferred through a USB port into the computer where it can be viewed and analysed easily. 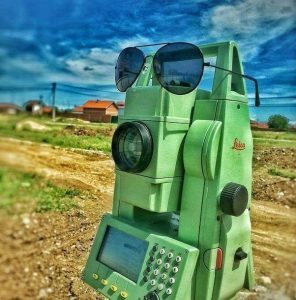 Theodolites can only measure angles, have a minimum range of about less than a kilometer and are less precise when compared to Total station, also less expensive than total station. Nowadays we have electronic theodolites which are an upgrade over the normal theodolite. Total station on the other hand can measure different data rather than just angles. They have a minimum range of about 1 km and are very precise. They are hence obviously expensive when compared to theodolites. A total station incorporates a theodolites functions into it’s programming, measuring angles and using an electronic distance meter. Total stations are usually superior to theodolites given their digital integration and more consistent precision. They also can be purchased with a robotic ability, that reduces the number of operators needed, to one. Total stations (both robotic and non-robotic) are more expensive than theodolites, usually much more so, as well as requiring more training to use. These are the difference between theodolite and total station. ← What is the difference between Creep and Shrinkage?